Fried chicken is one of the tastiest foods on the planet. The skin of the chicken is fried crisp, keeping the juices held within the moist and succulent meat (unless it's overly fried). 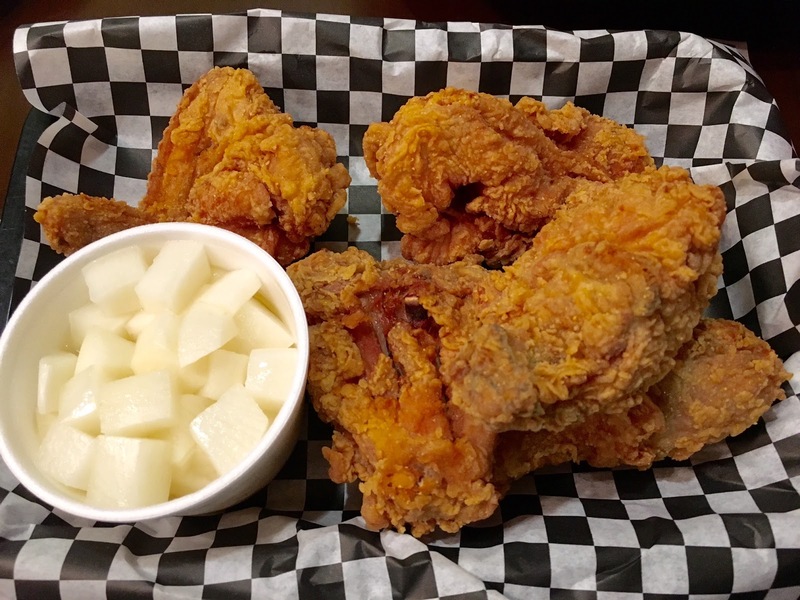 So when my friend suggested we hit up one of the most popular and authentic Korean fried chicken spots in our hood, it was only natural I agree to the lovely idea. BBQ Chicken is apparently one of the biggest fried chicken franchises in Korea. They are known for cooking up healthy fried chicken because of their use of olive oil as their cooking oil (I'd like to think this is true but I know fried chicken is never healthy). Whether the chicken is healthy or not, it certainly is quite tasty and wasn't at all greasy. TUK-POKKI ($7.25): Rice Cake, Fish Cake, Green Onion in a Spicy Red Chilli Sauce. This is pretty darn good. I love rice cake and anything spicy and this is the perfect combination. It's not overly spicy which is good for the weak ones who aren't the biggest fans of spicy food. It's chewy and delicious. MY FAVORITE DISH. ORIGINAL CHICKEN (5PCS- $9.99): Chickens are marinated, battered and breaded with over 30 ingredients. I would say this is definitely better than your everyday KFC. The skin is extremely crisp and the chicken was extremely moist and juicy. I loved the flavor of the chicken. I ordered a side of Sweet and Spicy sauce to go with my chicken for $0.50 and the Sweet Radish Pickles for another $0.50. The sweet and spicy sauce definitely tasted like the name says: sweet and spicy. The sweet radish pickles were a great accompaniment to cool off the spiciness from the sauce, crunchy to the bite. I definitely recommend getting both to enjoy the full flavor of this delicious Korean fried chicken. Overall, BBQ Chicken is a great alternative to your everyday KFC (and tastes better too)! The chicken skin is crispy, the meat is moist, and the condiments as well as the sauces complement the chicken nicely. With the New Year just starting and resolutions kicking in, I would like to stick to the healthier version of fried chicken and pick something cooked in olive oil. I've been to events at other places, but this was my first time in here. Great Seattle venues. Food was good and seating was very comfortable. Also, very good view from where I sat. This is such a cool venue and the atmosphere was equally amazing.